Beet, Orange and Walnut Salad - A recipe from Savor California, the online showcase for extraordinary gourmet foods and beverages from California. Photo by Mark Thomas Studio. Wrap each beet in a piece of foil, sealing tight. Place all the beet packages on a foil-lined baking dish. Bake for 1 - 1 1/4 hours. Beets are done when a knife can be easily inserted. Allow beets to cool until you can handle them. Slide your fingers over the surface of the beets and the skin of the beets will peel off easily. Cut the beets into wedges. Peel 2 of the oranges, taking care to remove all the white pith carefully separate the peeled oranges into separate segments. Set aside. Squeeze the juice from the remaining orange. Set aside. In a bowl, combine 1 tablespoon of the walnut oil, sugar, salt and pepper. Add the walnuts and toss well to coat. Place the walnuts in a single layer on a baking dish and bake 5-7 minutes. Allow nuts to cool and chop coarsely. In a bowl, combine the orange juice, olive oil, the remaining tablespoon walnut oil, and red wine vinegar. Add salt and pepper to taste. Toss the lettuce leaves with three-quarters of the vinaigrette and spread on a platter or individual dishes. Toss the beets with the remaining vinaigrette. Top the greens with a layer of beets. 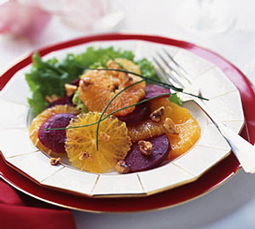 Arrange the orange wedges decoratively around the mound of beets and sprinkle the seasoned nuts over everything.